Take a vacation of fun! Take a vacation of fun with Tropix 2: Quest for the Golden Banana! Play Tropix favorites like Coco Bowl, Cascade, and Puffer Popper! Or try your hand at all-new games like Ice Cream Parlor, Stone Stacker, Fish Swap and more! 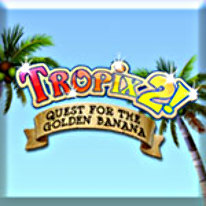 Each game in Tropix 2: Quest for the Golden Banana is a unique experience featuring hours of gameplay. Earn sand dollars to decorate unique islands along the way and unlock an original storyline featuring everyone's favorite monkey, mermaids, pirates, and a few new friends. Whether you like puzzles, word games, action, sports, or even hidden object games, there's something for everyone in Tropix 2: Quest for the Golden Banana. Escape to a paradise of games today!